Support us for premium products direct from the manufacturer. We like to regard our relationship with suppliers as one among equals, at eye level, working together on first-class products and together reacting to the current market situation. This way, we can make improvements and work efficiently in cooperation and with a sharp focus on the market, which means a higher level of productivity. If we extend our supplier portfolio, we would like to do this in cooperation with you to manufacture premium products, always bearing in mind the necessary measures for preventative quality assurance and in close coordination with the quality management department. 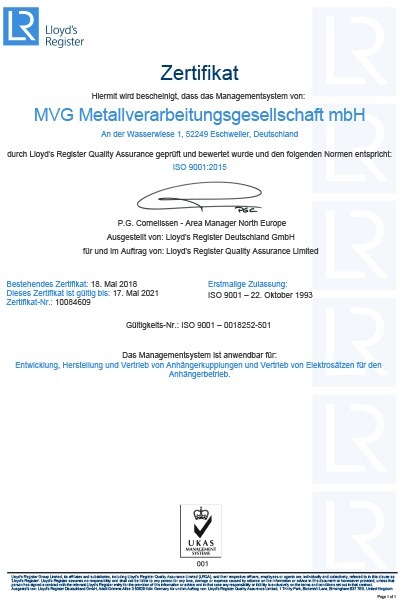 MVG – Our towbars stand for high-quality products designed and made in Germany, certified in accordance with ISO 9001* and IATF 16949 (*in this case the first manufacturer of towbar and electrical kits in Germany). Our products are developed, designed and manufactured in premium quality. In our plants process-parallel quality control is continuously carried out throughout the production to monitor our state-of-the art manufacturing technology and, in this way, we can guarantee first-class product quality for our customers. In 1993 MVG was the first towbar and electrical kit manufacturer in Germany to receive the quality certificate in line with ISO 9001. Renowned as a worldwide standard, ISO 9001 certification defines the effective quality management for ‘MVG – the towbar’ and is awarded for QM documentation on quality policies, targets and functions of the company. Here it is not only responsibilities, competencies and structures that are documented in binding and transparent form, but also workflow methods in the course of process and procedure instructions, which are individually implemented in the stipulated framework of the certification. »MVG – the towbar« stands for quality products designed and made in Germany and was awarded the ISO/TS 16949 certificate in 2001. 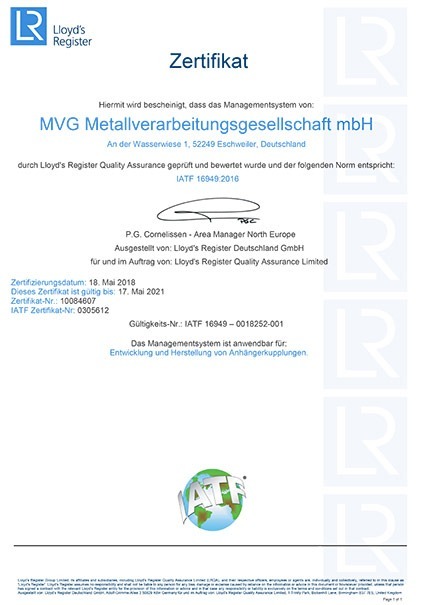 This certification is awarded on the basis of the specifications provided by the International Automotive Task Force (IATF) and is relevant for the entire supply chain of the automotive industry, and so also for our manufacture of towbars and electrical kits at »MVG – the towbar«. In May 2018 we were certified as one of the first manufacturers for the new IATF 16949, which replaces the ISO/TS 16949. As a supplier you support our quality standards on your part. You provide the technical and specialist competence to back up our high-quality standard, and with a sound quality management on your part, you can guarantee us the delivery of faultless goods before serial production starts – one of our fundamental prerequisites. This combined with on-schedule deliveries and in cooperation with our quality assurance department you will be contributing to a defect-free production launch. If you too are looking for long-term partnerships with companies already in the market and would like to help us extend our supplier portfolio, we would be very pleased to hear from you and look forward to an exchange of information.